Top Cash Back Giveaway | A Savings WOW! 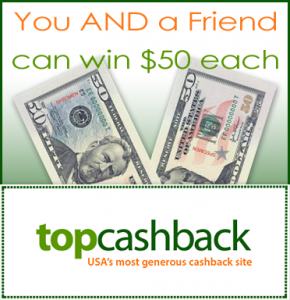 Grand Prize: $50 Cash (deposited into your Top Cash Back account) for you and one to give to a friend! TopCashback.com is the USA’s most generous cashback rebates website as it gives you the FULL commission rate it’s paid by its 2,400 merchants – 100% of it – back as a cashback rebate; not just ‘a share’ like other cashback portals. There’s no minimum withdrawal threshold so you can even cash-out $0.01, plus it has a bunch of coupon codes that can be used simultaneously to earning cashback as well. It has a handy iPhone app so you can save money on-the-go too! The giveaway will open up on 10/8 12:01 am EST and close on 10/11 at 11:59 pm EST.